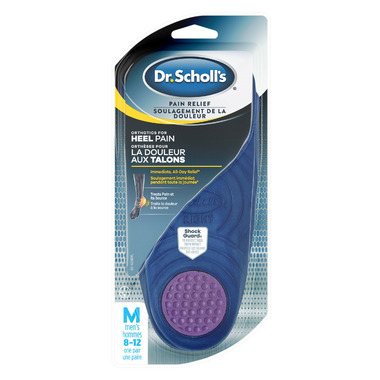 Dr. Scholl's Pain Relief Heel Pain Orthotics are clinically proven and offers immediate all-day heel pain relief. It relieves pain from plantar fasciitis and heel spurs. The soft foam absorbs shock and it has a cupping design that supports the heel’s natural padding. It is fully supportive for the arch. The ¾ length design fits easily in your shoes. Dr. Scholl's Heel Pain Relief Orthotics are clinically proven to provide immediate and all-day relief from heel pain, including pain from heel spurs and Plantar Fasciitis.